The expulsion of Julian Assange from the Ecuadorian embassy in London, scarcely a surprise after many heavy hints were being dropped that it was in the works, is outrageous on many counts. 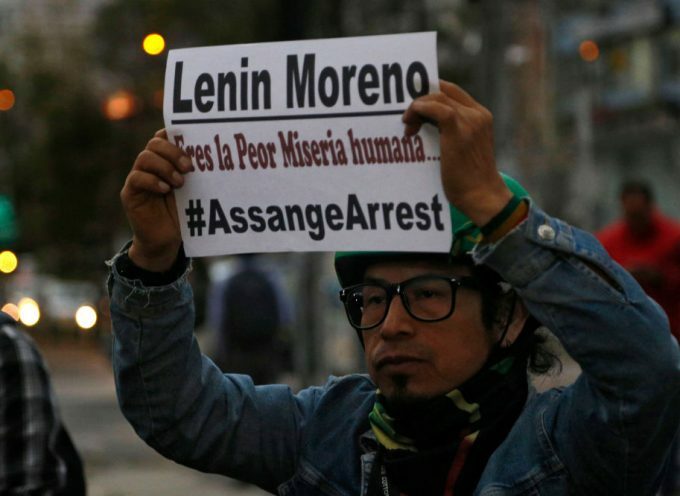 Not the least of those is the fact that Assange was made citizen of Ecuador by the government preceding that of the almost offensively misnamed current President, Lenin Moreno. 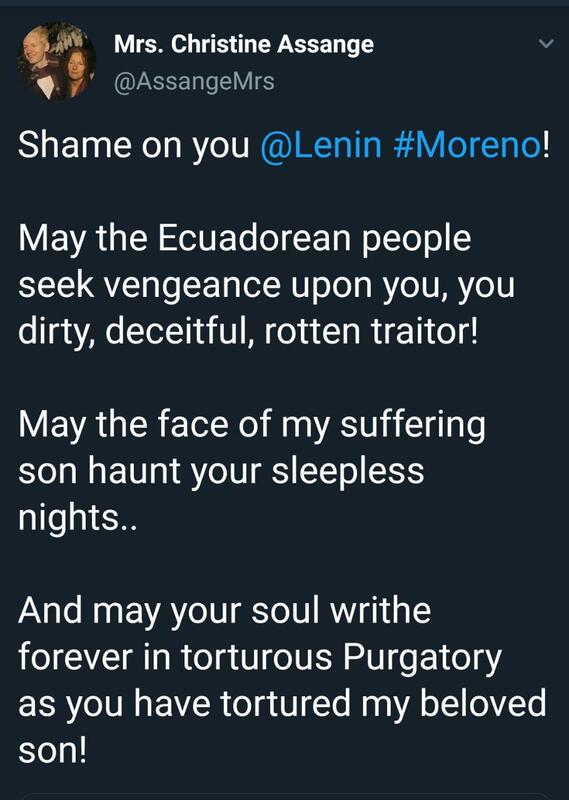 Ecuador has, in effect, handed over its own citizen, who had taken refuge on its sovereign territory in London, to the tender mercies of a foreign power which sought to physically capture him on vague and probably legally unsustainable charges. In the process it has further humiliated and abased itself by giving permission to the police force of the host country to invade the sovereign premises of its diplomatic mission in order to consummate the previously agreed upon abduction. Think about the precedents that this sinister operation is setting. The Ecuadorian government was no doubt subjected by the world’s leading “democracies” to unimaginable pressure to agree to this dastardly act which, along with the self-proclaimed “presidency” of Juan Guaido, may have been conceived to set a new normal in international relations. But the venal, utterly corrupt nature of this scandal is most clearly reflected in the fact, published simultaneously with the execution of the criminal kidnapping, that a $4.2 billion IMF loan to Ecuador’s government was finally approved, no doubt by pure coincidence. “This money will create work opportunities for those who have not found something stable,” Moreno gushed shamelessly. He forgot to mention for the edification of his people that the illusory opportunities he referred to will have to be repaid to international banks by Ecuador’s impoverished masses with hefty interest and that, in addition to moral ignominy, as a result his country has now sunk several billion dollars’ deeper into debt slavery. Historical analogy buffs will recall that in 1993, as the Security Council of the United Nations was presented with Resolution 827 to establish, contrary to the provisions of the UN Charter, the illegal Hague Tribunal for the Former Yugoslavia, the hand of Yeltsin’s delegate was never raised to veto it. If anyone is wondering about the reason, it was the expectation of a promised Western loan to cover a huge shortfall in the Russian budget and to give a new lease on life to the compliant Yeltsin regime. Remarkable, isn’t it, how bad history repeats itself? Translation: the most obvious sentence one could pass over total disgrace the world media has become can be seen in the fact that nobody was here to film the arrest of Julian Assange, only us (RT). That in spite of the fact that everybody already new that he would be expelled. Now they have to come and ask for our footage. CNN and The Guardian have the gall to call us and ask how it is that we were the only ones to get this footage. It’s obvious: you are just the spineless hypocritical servants of your Establishment and not journalists at all. 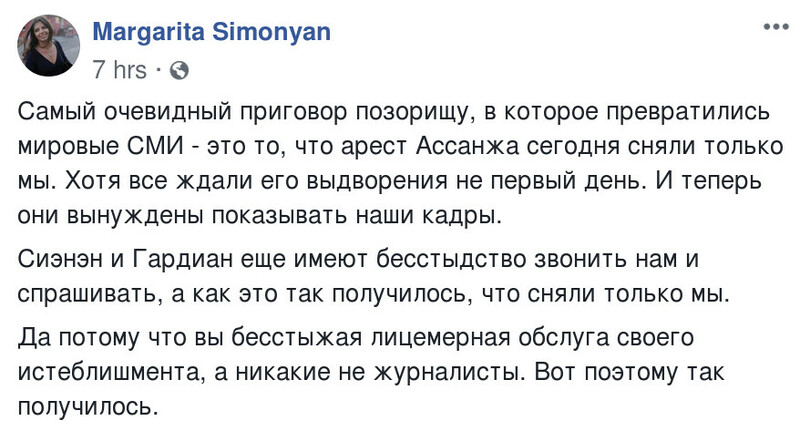 This is why such a thing happened.